A helmet is the most essential safety equipment for a two-wheeler rider. With a wide variety available, Auto Bild tells you how to choose the right one. You might consider yourself the toughest guy in the neighbourhood, even then, your skull is unlikely to survive the impact of a collision. Even a seemingly innocuous knock can be fatal if the helmet is not good. Head injury is the most common reason for fatalities among two-wheeler users. In most parts of the country wearing helmets while riding a two-wheeler is mandatory by law. But some people, in order to save a few hundred rupees, settle for cheap and uncertified brands, putting their lives at risk. We tell you how to buy a helmet that is safe and comfortable to use. Essentially there are two types of helmets. A full-face helmet covers your entire face including the chin and the jaw bone your chin, while the other is the open-face type that covers the skull, but leaves the face exposed. Apart from these two, you also get the flip-face helmet that's like a full-face helmet, but the visor along with the jaw protector can be flipped open making it a open-face. Try out all options before you select the one that suits you. Some people tend to feel claustrophobic in a full-face helmet, so an open-face helmet makes more sense. However, we strongly recommend a full-face helmet since it offers maximum protection. A helmet should fit snugly around the cheeks and should not bob up and down when you shake your head. But remember that it should not be so tight that you start feeling strangulated. The best way to determine a good fit is to insert your index finger between the forehead and the helmet. At best, only the tip of your finger should go in and not more than that. You can also ask the dealer to help you with proper fitment in case you need any assistance. Clear vision through the visor is very important. Therefore, it is advisable to buy a helmet with a scratch resistant visor or a faceshield. Some visors are injection moulded, while others are bent to the shape of the helmet. Also, put on the helmet to check the amount of peripheral vision and if the visor fogs up or not. In some high-end helmets the visor comes coated with anti-fogging agents. These days many helmets are equipped with inbuilt sun visor, which means you do not have to change your visor in case you are riding in bright sunshine or switch back to a clear visor at night. Also ensure that the visor does not distort the vision. Those with deep pockets or those who have a more enthusiastic outlook towards two-wheelers can opt for highend helmets like Shoei, Shark, Arai and Schubert among others. These helmets meet the strictest safety norms and are extremely light and durable as they are made of carbon fibre. 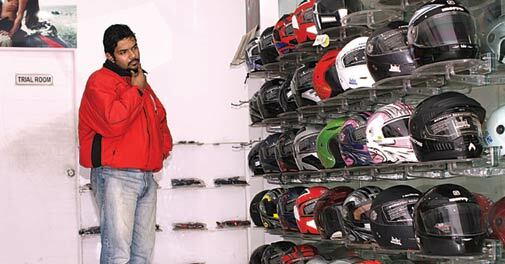 A basic carbon fibre helmet can set you back by Rs 13,000, while some of the top-end ones can cost as much as Rs 60,000. Not only do these helmets look good, they offer maximum safety. Choose a helmet that conforms to the established standard safety norms. A helmet might look good, but if it doesn't meet the safety guidelines, there is little point in buying one and trusting your life with it. For Indian brands, look out for the Indian Standards Institution (ISI) mark, which means that the helmet meets the safety norms laid down by the Bureau of Indian Standards. These norms are revised periodically. For international brands, you look out for DOT, ECE, Snell, and BSI stamping on the helmet. These marks should be accompanied by hologram stickers, which certify that the helmet you are buying has been tested and can protect your head from trauma in case of a sudden impact. Opt for a helmet which has removable and washable inner lining. Not only does it help to keep the helmet clean and free of stink, also prevents the chances of skin infection. If you are using a helmet in hot and humid conditions, it is better to wash the lining at regular intervals. There are a lot of options when it comes to purchasing a helmet. Choose one that fits you perfectly and suits your budget. Try out various helmets before finalising one. Always go for a certified helmet. With the advent of technology, nothing seems impossible. If you fancy yourself as a gadget freak or get a lot of calls, try out a helmet with an inbuilt Bluetooth system. You can pair the helmet with your phone and take calls on the go without the need to stop. But these helmets might cost more than regular helmets. You also get aftermarket external attachments, but then they are unprotected from wind noise. Never buy a used helmet. Even if you are getting a helmet from an international brand at a fraction of a cost, there is no point in buying one. Despite the lack of any visible sign of damage, the helmet might be structurally compromised. Always buy new helmet that comes with the manufacturer's warranty. A good ventilation system not only provides comfort, it also keeps things cool under the helmet, especially in a hot country like ours. The fresh air flows through the vents, pushing out the stale air, thus keeping rider feeling fresh. A helmet with a good ventilation system will have channels carved into the lining for smooth air flow. While buying such a helmet check if the vents are working properly. Should you invest in gold buying schemes by jewellers?